Fork + Bottle Dinner: BBQ and J. Rieger & Co.
Do you love a fine wine? Craft beer? Sipping bourbon? So do we. Join The Hive for Fork + Bottle, a unique dinner series in which we educate, pair, and taste inspired menus by executive chef Matthew McClure with a variety of guest beverage experts. 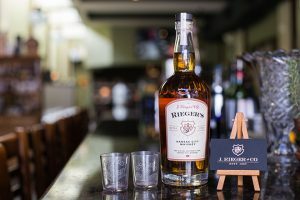 In July, join us for a multi-course barbecue dinner with beverage pairings by J. Rieger & Co., who was the largest mail-order whiskey house in the United States prior to the onset of federal Prohibition in 1920. The evening will kick off with a welcome cocktail and passed hors d’oeuvres, followed by a seated multi-course dinner and beverage pairings. + Seats are limited! Call Emily at 479.286.6518 or email ewilkerson@21cHotels.com to reserve your spot.